This is a quick summary for an overview. For much more information and references click here. 1) Isn’t the polio virus very dangerous? The polio virus rarely makes you sick, and in the rare cases you get sick it is usually just like having a cold. 2) If the polio virus is not normally dangerous, what causes the paralysis? Epidemics of polio, in which there were cases of paralytic polio, were not recorded to occur until 1887. This is why polio is called a “20th century disease”, even though the polio virus itself has been around for a very long time. What made it start to occur? This is because what provokes it is intramuscular injections, particularly vaccinations, and before the late 1800s, intramuscular injections were never given on mass. 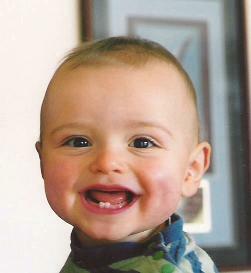 Terms such as “provocation poliomyelitis” and “vaccine-associated poliomyelitis” are used when referring to it in medical research for this reason. Polio epidemics have always followed on from intensified vaccination programs. 3) Didn’t vaccination eliminate polio? Polio had declined from its peak in 1950 by 80-90% by the time the polio vaccine was introduced in 1956, so the vaccine was not responsible for its decline. Indeed after the vaccine was introduced, the incidence and deaths from polio increased, which was a major problem. 4) So what did eliminate polio? This is where it gets interesting. In 1958 the definition of polio was changed to make the diagnostic criteria so restrictive that it became almost impossible to call an illness polio even when the person suffers paralysis and the polio virus is present. 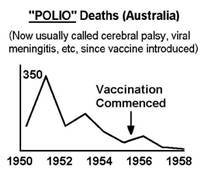 Immediately this change occurred the number of cases of “polio” crashed, and the number of cases skyrocketed of “other” diseases, such as “viral meningitis” and “cerebral palsy” (up to 75% of these cases are actually polio). All the vaccines – for DPT, MMR, Hib, polio etc are still provoking polio to this day, but the word “polio” is very rarely used. When paralysis occurs it usually does not last more than a couple of days in which cases usually no diagnosis is given when they occur these days. 5) What about all those children that were in hospital wards in iron lungs? Iron lungs were found to be counterproductive for the treatment of polio so use of them discontinued. It’s as simple as that.